100 women are deeply absorbed in watching a film we never see, as we observe instead how the drama plays out on their faces. Abbas Kiarostami is widely regarded as one of the most important, ambitious and rewarding filmmakers at work today. With Shirin, he continues to explore the potential of cinema, stimulating and challenging the viewer's imagination to an extraordinary degree. 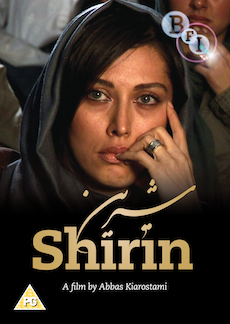 What Shirin shows us – and indeed all it shows us – is an audience of more than 100 women who are deeply absorbed in watching a film we never see. We observe instead how the drama plays out on the faces of the audience, seen in close up, mostly one at a time – a mesmerising series of portraits of women, young and old, their expressions variously wistful, quizzical, amused, enraptured and distraught. Based on the powerful 12th Century Persian poem by Nazami, the film-within-the-film is a story of star-crossed lovers and female self-sacrifice that is as well known in modern-day Iran as Romeo and Juliet is in the West. Taste of Shirin (2008) - Hamideh Razavi's documentary on the making of Shirin. Illustrated booklet containing essays and credits. Dolby Digital PCM audio throughout.